Taking inspiration across the creative spectrum, from comic books to romantic portraiture, Craig Davison's paintings are a unique mix of old and new styles. He has worked in the arts since the eighties, and his work is awash with colour and life. Browse and purchase our range of Craig Davison paintings here. Born in Sheffield in the mid-sixties, Craig Davison loved art classes at school, but neglected to further his studies in the subject. This didn't dull his childhood interest in the arts, however, and the young Davison devoured comic books and science fiction films, but took as much inspiration from the games he would play whilst riding bikes with his friends. It is these formative experiences which have sparked his imagination and enthusiasm ever since. In his early twenties, Davison secured work as a cartoonist for comics aimed at under-fives, illustrating such pre-school icons as the Wombles and Bangers & Mash. Taking up illustrating as a nine-to-five career cemented his skills, leading to a career pivot into animation and design for video games. Davison worked on the characters such as The Hulk and Zorro, as well as designing the characters and concept for his own game, Johnny Bazookatone. Through his video game work, Davison moved into sculpture, creating 3D reference models for animation. After a few years working in this medium, however, freelance sculpture work was more difficult to find, which brought about his decision to resume painting in 2007. Whilst the interest had never left him, other channels for his creativity simply took priority until that point. "I used to stockpile [images and ideas] in my head where they fight to be used," he once wrote. "Once I start one painting, I'm already planning the next." Davison describes the style of his work as having "a slightly naive, grubby look with loads of energy", and his vivid paintings certainly capture the rush of childhood enthusiasm, with childish characters popping from his colour-covered canvases. 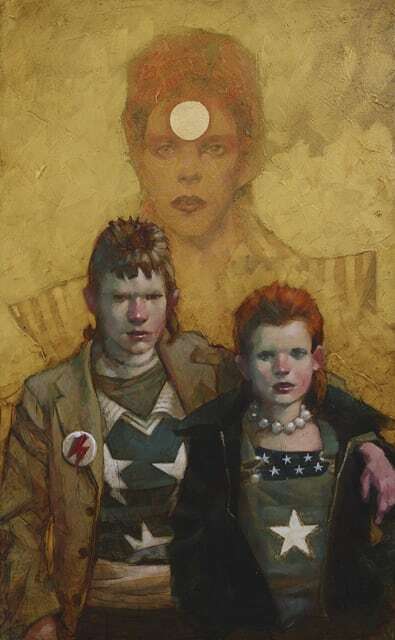 Many of his portraits do not actually depict characters from comic books or the Star Wars films themselves; rather, his figures are fans of those things, portrayed in costume to show their own love for their favourite films or comics. Extremely quickly, these paintings have garnered universal acclaim, with Davison's work being exhibited across the country and being sold to collectors worldwide. Craig's devotion to the Star Wars franchise has recently been reciprocated, as he counts Luke Skywalker himself, Mark Hammill, as a fan. Craig Davison lives and works in County Durham, with his dogs.